This time is specified in seconds and will be used in blocks where setting is Wait Loco. A value of zero will be replaced on the fly with 10. The maximum wait time in blocks. Default zero seconds which disables this option. This wait time overrules the calculated block wait time for this loco and its priority level in case the new destination could not be locked. Use with care and keep the timer as low as possible to avoid overrunning other events! This is the approximately delay in ms between the enter and the in event when an enter2in sensor is used. The block event timer is used if the loco's event timer is set to zero (see: Block Routes) or Force block timer is selected. The value is specified in %. When an in or enter2in event occurs with a timer value other then 0, the timer value is corrected with the event correction percentage. By adjusting this setting, the stopping characteristics of individual locos can be compensated so that all locos stop at the desired place. See: Block Routes for details on the in event timers. Using very low percentages almost nullifies the timers used in the blocks. For example if the percentage is set at 1% and the timer at 99000 ms (99 seconds!) then the delay is 99000 ms * 0.01 = 990 ms, thus less than one second. Train priority used for multiplying the block wait time if no destination is found. Default priority is 10. The lower the priority the more CPU power is used. Tip: Use with care and lower it only for a few High Speed trains. Some Command Stations will send an emergency break before changing direction, which will cause an abrupt stop of the locomotive. In that case this option can delay the swap command(which results in a direction change) by the number of ms specified, to avoid this abrupt stop. The swap will be executed directly at the "in event" in terminal stations in case the loco swap timer is set to zero. If the reported energy percentage get below the minimal energy percentage, the loco or automobile will send to the Home Location. If this value is zero, default value, the go home action will not take place. Use this tour on start-up. This optional ID is for trains running always the same tour and saves setting it by hand. This optional ID is for trains running always the same schedule and saves setting it by hand. The type will partly influence the choice of a new destination block depending on the block settings and permissions as described here. By using trains, the train-type of the train overrules this setting. This flag is needed if the locomotive should be used for commuter trains. Only blocks allowing commuter trains can be entered. The option is not needed for trains exclusively travelling between blocks defined as terminal stations provided option Stop Non Commuter Trains in Terminal is not activated. However, only commuter trains are allowed to change their direction in blocks other than terminal stations. The blocks in this case must allow commuter trains and direction changes. Further details are described on page Setting Up a Commuter Train. Departure times in schedules will be used by this train. If the global flag is not set in the rocrail.ini this option is available to every individual train to get a better through put. This could be useful for Inter City trains. This extra option will reserve the second next block also in case it must wait, which is for ICs very useful to be able to depart as planned. The same option must be set in the block where the loco must wait. Short trains can use this event to stop in a block. Only usable when a block has a shortin and an in event defined. The locomotive will solely run on manual set routes if this option is activated. For more information see: Manual operated routes. This option will force the wait time specified in the loco properties in every block regardless of the block settings. If set the checking for free destinations will continue after the enter event and until reaching the in event. If in the meantime a free destination block becomes available the train accelerates again and is not forced to stop. Use the Block depart delay for this loco. This option is only usable with very short trains, should be used with care to avoid accidents, and is not supported in the Forum. It frees up the previous block and the current route on the free or enter event to make it available for other trains. This option also depends on the Block option. The BBT From block option does not function with this option activated. Track driver systems, like Dinamo, are NOT supported. Sends a velocity zero command to the loco decoder to swap the front lights after a swap placing. Also useful for updating throttles in case of half automatic. 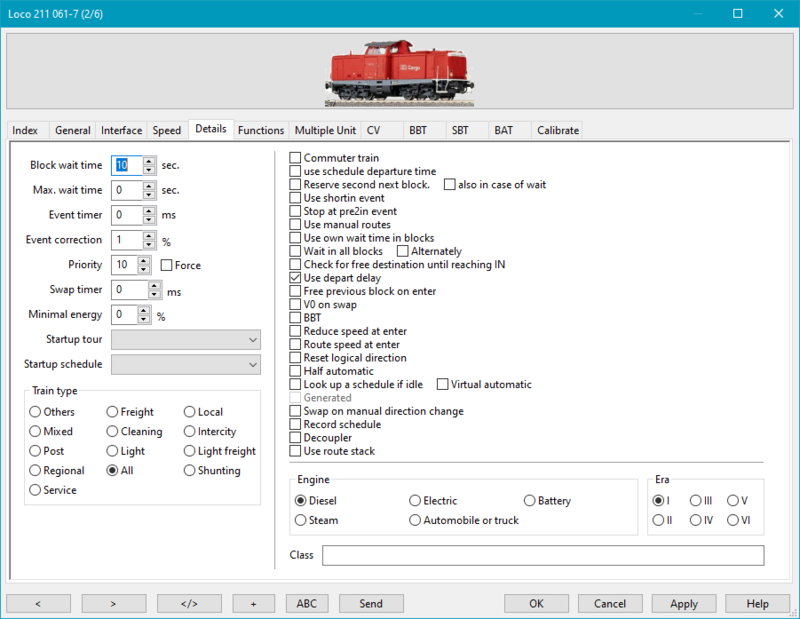 Activates the Block Brake Timer ( BBT ) for this loco in blocks with the BBT-option activated. Reduce speed at ENTER if the next route has thrown switches. This option depends on the No speed change for switches Server option. Use the next route speed at ENTER. This option will only have effect if the Route speed at enter option is set in the route properties. This option overrules the Reduce speed at enter option. Initial, at startup, the loco placing and direction will be reset to the default values. Use with care. It is only introduced for those who remove the locos from the layout at the end of a session. To use this locomotive in half automatic mode even with Drag and Drop. The loco class fits to the Schedule Class. The schedule is not relative. The model hour fits in the From/To hour schedule frame. If hourly schedules are used, "recycle" in the schedule definition is disabled. Nevertheless the schedule will be picked every hour by this function. This lookup is triggered by every new model minute. After assigning the schedule to the loco it will be started in auto mode. With this option the loco will be started in virtual auto mode after assigning the schedule. This option is only active for the current Rocrail session and will be reset at startup. If set to Electric, and possible destination blocks are not "Electrified", then the locomotive will probably not find a new destination block. The Loco class used in Block, Route permissions and actions. Can be modified by the Loco action class. If the loco has a train assigned the class of the train will be used instead.